Hello and happy Tuesday. It's time for another challenge at CASology. 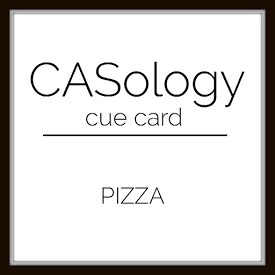 This week, our cue word is Pizza. Are you hungry yet? Do you like pizza? I had the best pizza ever a few years ago, when we went to Rome for a family vacation. To keep this card CAS, I only colored in three tiny areas. As a nod to the traditional red checkered table cloth found in so many pizzerias, I created a frame out of some red gingham paper. Now it's your turn. How does PIZZA inspire you? Go and grab a slice--then come back and play along. Please remember to keep it Clean and Simple. Our Guest Designer is Maja. Love your wonderful card...almost makes me wish we were having pizza for dinner and in Italy too! Such a fun card, Joyce! I love how you did selective coloring on your images and your plaid border is the perfect touch! Perfect for the cue word Joyce!! The red gingham is the icing on the cake..or the cheese on the pizza!! What a genius idea to simply create a 'pizza feeling'! I love your card. It drags me right into the scene. Superb! What a cute idea for this week's cue word! Pizza in Italy sounds like such fun! I'll never have pizza in Italy but I can dream looking at your little scene, Joyce. Your pizza in Italy card is fantastico Joyce!